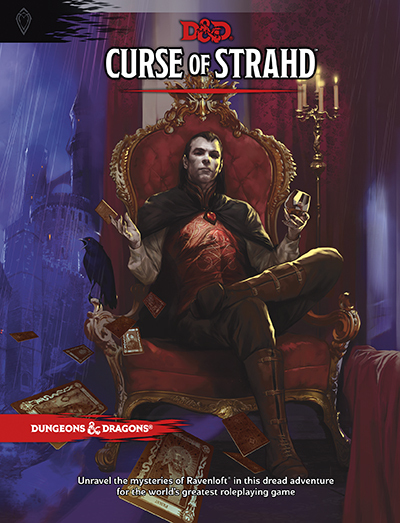 Curse of Strahd revealed! Castle Ravenloft is waiting you! A new terrifying adventure is coming from the mist: the vampire Count Strahd von Zarovic is waiting for you. Castle Ravenloft is waiting bold adventurers with cold blood ready to feed darkness bites. Heroes from the Forgotten Realms and other D&D worlds can easily be drawn into Strahd’s cursed land. Once there, they must contend with the horrors of Barovia. Its people are melancholy, misshapen and grotesque, living in fear of the wolves and other creatures that serve Strahd’s evil will. Written by Chris Perkins, Tracy Hickman, and Laura Hickman, edited by Kim Mohan and Jeremy Crawford, and art directed by Kate Irwin. @JeremyECrawford @JimZub Any chance of Ravenloft getting a setting treatment? Or is this going to be a standalone that I’m still buying ;)? @ChrisPerkinsDnD @SlyFlourish @Morrus Is Barovia still in the Demi-plane or is it back in the material plane in FR somehow? ~@JamesIntrocaso Madam Eva only works with a retweet, not replies. Spread the word!